As the temperature cools in the Fall, here at the Inn we bring out the s'more maker on the porch. Guests can make their own s'mores the traditional way. And we also make another version with brownies that is a huge favorite with the guests. Position a rack in the lower third of the oven and heat oven to 350 degrees. Line an 8 by 8 inch baking pan with foil so it hangs over the edges by one inch. Meanwhile, make the brownie. Melt the butter and chocolate in a medium microwave safe bowl in the microwave. Melt for 1 minute then stir, repeat one or two more times until completely melted and smooth. Stir the light brown sugar and white sugar, vanilla and slat into the melted chocolate mixture. ad the eggs and beat vigorously to make a thick and glossy batter. Add the flour and stir just until incorporated. Pour the batter into the prepared pan and bake until the top is crispy and a toothpick inserted into the middle come out mostly clean, with a few crumbs...about 40 to 45 minutes. Remove the pan from the oven. Move the oven rack up to about 6 inches from the top. Set the oven on low broil. 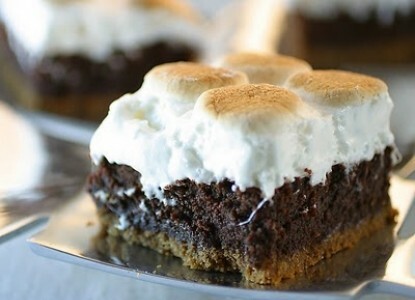 Layer the marshmallows across the top of the brownie and place back in the oven. toast under the broiler until golden, about two minutes. Watch closely so it does not burn the marshmallows. Cool completely, then gently remove the brownies from the pan using the foil flaps to pull it out. Carefully separate any marshmallow that is stuck form the foil.